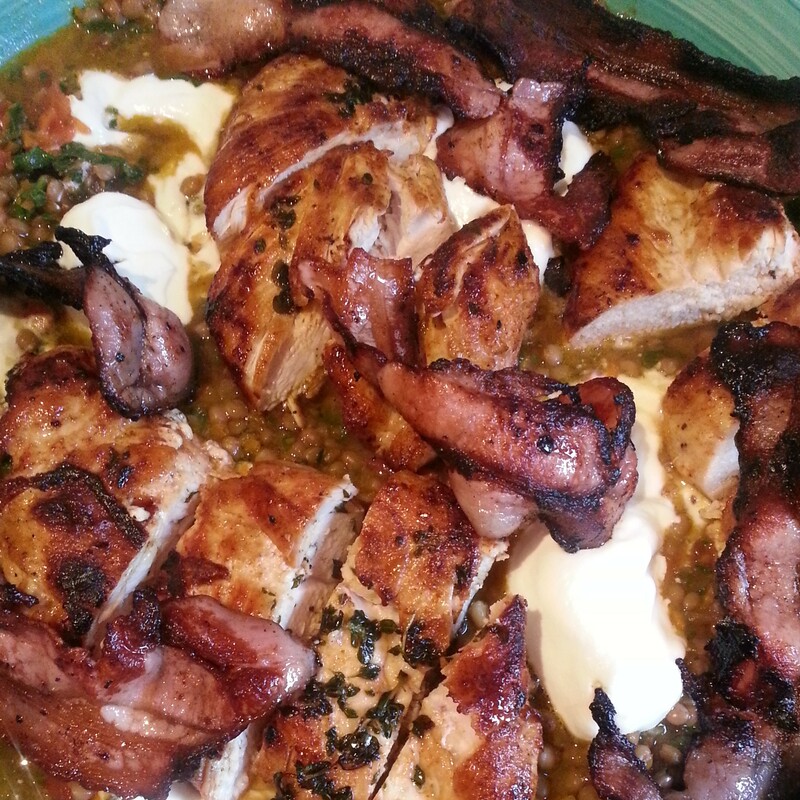 Jamie Oliver’s 15 minute meals spiced chicken with spinach lentils recipe. The first in my new series, The Chef and I. Welcome to the first of a new weekly series! The Chef and I will see me cook a recipe from my cookbook library. It could be a dinner, maybe a breakfast or something sweet, the idea being to a) use my cookbooks more thoroughly and b) show how a recipe plays out for a normal human. This week I’m (finally) cooking from Jamie’s 15 minute meals. Yes yes, we all know the drill, 15 minutes when you have a staff working for you but my attitude is less the amount of time it takes you and more cooking with fresh ingredients and trying recipes you otherwise wouldn’t. This didn’t take me 15 minutes but it definitely took me less than 30. Probably closer to 20. All my normal eaters ate it and loved it. Even the lentils. Jasper, the not normal eater, ate and loved the chicken. Small mercies. Jamie serves it with a warmed loaf of bread to soak up the juices and I strongly urge you to do the same (I wasn’t going to bother but thought, no, do as the recipe says). It rounded out the meal beautifully. Next time I’d probably use some pita or flat breads. I used streaky bacon instead of pancetta and fried it off separately after cooking the chicken whereas he adds it to the pan of the almost cooked chicken. Streaky bacon is the short bit of the bacon, my Woollies stocks the D’Orsogna brand variety of it and stocks it in the meat section of cured meats, not with the other bacon (for reasons I am yet to understand). His recipe uses a bunch of asparagus that he cooks off with the chicken at the same time as the pancetta, I didn’t do this. Get a really large sheet of baking paper out on your bench. Scatter over a generous amount of salt, pepper and the paprika. Rub into the chicken all over (if you've been generous there's enough for both sides and a good rub into the chicken). Get another fry pan on with a glug of oil then add the garlic cloves, the herbs and the chicken. Fry for about 4 minutes on each side until nicely golden and cooked through. Roughly chop the spinach in the food processor - you don't want it pulverised so just pulse it until it's shredded but not moosh. Add to the lentils with the red wine vinegar. Lift the chicken out of the pan, you might need to give it a wipe down before cooking the bacon and then fry off the bacon. Put the lentils into a wide lipped platter (it's runny so don't go and use some flat platter contraption) and dollop over the yoghurt, give it a little swirl through. Cut the chicken up on an angle and place over the top then put the bacon on top of that. Serve with crusty bread or pitas.